On April 27, House Speaker Richard Corcoran and Senate President Joe Negron announced agreement on budget "allocations" and initiated formal conference talks that began Thursday afternoon. Budget conference committee is expected to continue to meet through the weekend. The result of these budget agreements is filed as the Conference Committee Report. There is a 72-hour window for public viewing before the adoption of the report by both chambers. Each chamber then adopts the report, and votes on the final version of the budget. With historic funding, we’ve seen historic results. Our lawmakers shouldn’t slash tourism marketing efforts, instead they should follow Governor Scott’s lead and increase the state’s investment to fund VISIT FLORIDA at $100 million. We urge you to speak up now and reach out to your legislators today. Take action now. On April 26, SB 106 by Sen. Flores (R-Miami) and Rep. Avila (R-Hialeah) after two hours of debate passed the House 58-57. This bill removes a Prohibition-era law that prohibits the sale of liquor and groceries in the same store. 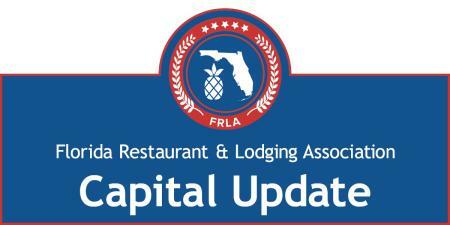 FRLA applauds the legislature&apos;s passage of this free market approach to reducing burdensome regulations. The legislation now heads to Governor Scott&apos;s desk, and he has 7 days from the time it is presented to him to act. Ask Governor Scott for his support. A tax package totaling nearly $300 million in tax breaks was unanimously approved by the Florida House on April 26. HB 7109 provides for a range of tax breaks and holidays, including sales tax breaks on diapers, feminine hygiene products, college textbooks and agricultural equipment and sales; and tax holidays for back-to-school shopping, emergency supplies and military veterans. This bill also reduces the state sales tax rate on the rental of commercial real estate (business rent tax) from 6% to 4.5% for two years, beginning January 1, 2018, then maintains a permanent tax rate reduction from 6% to 5.5% beginning January 1, 2020. The bill is scheduled to be heard in the Senate Appropriations Committee on May 1. On April 27, the Senate unanimously passed SB 1590 by Sen. Latvala (R-St. Petersburg), a bill that revises the beach nourishment and inlet management project funding criteria and requires a minimum distribution of the lesser of 7.6% of the funds remaining after the payment of debt service or $50 million to be appropriated annually from the Land Acquisition Trust Fund for projects that preserve and repair the state’s beaches in accordance with the revised project funding criteria. Its companion, HB 1213 by Rep. Peters (R-St. Petersburg), is in the House Government Accountability Committee. Chairman Latvala also indicated Thursday that House and Senate leaders have agreed to spend $50 million on beach renourishment projects in the coming fiscal year. The Senate and House continue to negotiate and trade offers. The latest offer from the Senate includes a key provision desired by Speaker Corcoran, allowing up to 1,500 slots machines in facilities in referendum counties with a requirement to surrender to the state one active pari-mutuel permit. The Senate offer also includes 2 casinos in Miami-Dade, decoupling, and reduction of the minimum amount the Seminole Nation would have to pay to the state. On April 28, the House passed 63-56, HB 425 by Rep. La Rosa (R-St. Cloud). This bill limits the ability of local governments to protect local communities from unregulated homes rented by short-term online rental companies. Its companion SB 188 by Sen. Steube (R-Sarasota) was amended in the Senate Rules Committee and has not yet been heard on the floor. On April 28, SB 388 by Sen. Hutson (R-Palm Coast), substituted for HB 423 by Rep. La Rosa (R-St. Cloud), passed the full House 110-9. This bill would allow cooperative advertising by beer companies and would let beer manufacturers participate in up to 25 events or promotions each year at theme parks that cover at least 25 acres and attract at least 1 million visitors per year. The bill would also remove a limit on wine bottle sizes and make it easier for consumers to take open wine bottles from restaurants, eliminating a provision that the wine must be purchased in conjunction with a full-course meal.